Background: Salsalate may offer many advantages over other non-steroidal antiinflammatory agents in patients taking warfarin, however a drug-drug interaction may occur which has not been reported in the medical literature or by the manufacturer of salsalate. Objective: To report a case of warfarin potentiation associated with salsalate treatment, which resulted in bleeding. Method: Clinical review of the course of a patient, who was stable on warfarin when salsalate therapy was added for chronic pain. 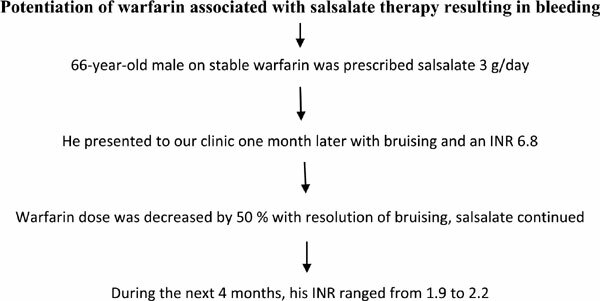 Case Report: A patient taking stable doses of warfarin for over 1 year (with good control) was prescribed salsalate 3 g/day for pain in his knee and lower back. Approximately 1 month later he presents to the anticoagulation clinic with bruising and an International Normalized Ratio (INR) of 6.8. The patient had a good response to his salsalate therapy and wanted to continue it. The warfarin was held for 3 days and dose lowered by 50 %. His bruising then subsided and he had good control of his warfarin therapy with INRs ranging from 1.9 to 2.2 over the next 4 months. The patient was then lost to follow up. Keywords: Warfarin, salsalate therapy, interaction, INR, NSAIDS, antibiotic. Keywords:Warfarin, salsalate therapy, interaction, INR, NSAIDS, antibiotic. Abstract:Background: Salsalate may offer many advantages over other non-steroidal antiinflammatory agents in patients taking warfarin, however a drug-drug interaction may occur which has not been reported in the medical literature or by the manufacturer of salsalate.